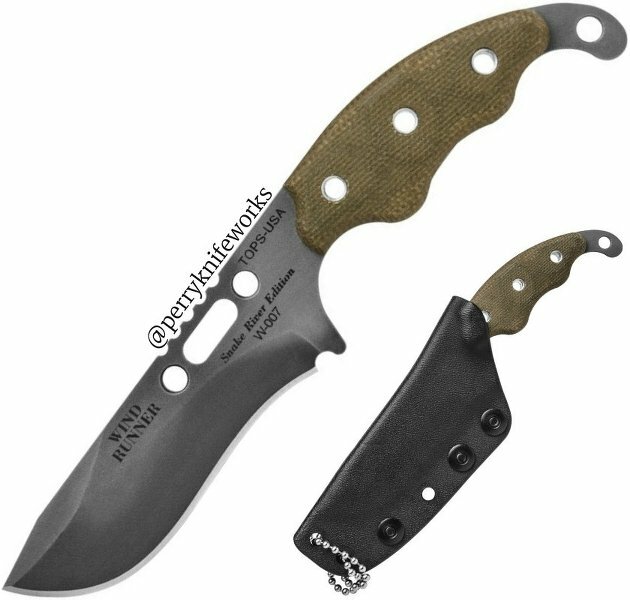 The TOPS Wind Runner SRE (Snake River Edition) is an Leo Espinoza designed fixed blade that is very versatile, making it an ideal knife for bushcraft, survival, and tactical purposes. It can be used to chop, but is also sized to complete smaller tasks. Built in TOPS Knives fashion, the Wind Runner SRE has a 1095 steel blade with a "black river wash" finish, which has a darkened finish along the edge where the blade has been heat treated. The handle is fitted with smooth green canvas Micarta scales for an uncompromising all-weather grip. This Snake River Edition Wind Runner comes out-fitted with a black kydex neck sheath with ball chain and safety whistle.